New Delhi [India], Sept. 17 : The Bharatiya Janata Party (BJP) has urged Congress party president Sonia Gandhi and vice president Rahul Gandhi to introspect on why they are not able to deal with political crises such as what occurred in Arunachal Pradesh on Friday (defection of MLAs). BJP leader Shrikant Sharma told ANI, "People have given up on Congress a long time ago, and now, their own people are deserting them because of their foul policies. By continuing to blame the BJP, they are only cementing their downfall." Sharma also that the Congress needed to avoid training its guns on the BJP every time. Anantnag (Jammu and Kashmir), Dec 10 : Saluting the people of Jammu and Kashmir for taking part in the ongoing assembly polls with enthusiasm, Congress president Sonia Gandhi on Wednesday said it was her party that had worked for the development of the state without any bias. "It is easy to showcase dreams, but the Congress party actually worked for the development of everyone without any kind of bias and keeping the ground realities in mind," Sonia said at an election rally here. Taking on the ruling Omar Abdullah-led National Conference state government, Sonia said the relief work during the 2005 earthquake had been much faster. Jamshedpur (Jharkhand), Nov 30 : Congress party president Sonia Gandhi, hit out at the Bharatiya Janata Party (BJP) for favouring capitalists over the masses. Speaking at an election rally here on Saturday she said the BJP wants to privatise the coal mines because the party wants to benefit certain chosen capitalists. "They want to privatise the coal mines which were nationalised by the Congress party, which will benefit some of their preferred capitalists and as a result of this you will face huge losses," said Gandhi. Gandhi also said the BJP made tall promises but never fulfilled any of them. New Delhi, Nov 13 : Congress President Sonia Gandhi on Thursday took criticized the forces in the country for attempting to belittle the legacy of India's first prime minister Jawaharlal Nehru's and "destroy his ideals". "Nehruji's ideologies are not just a part of history, they inspire us even today and undoubtedly it will inspire generations to come. We should remain committed to fight those who want to destroy the liberal and progressive edifice of India," said Sonia while addressing a party conclave here at the Talkatora Stadium to mark the 125th birth anniversary of Jawaharlal Nehru. Meham (Haryana), Oct 4 : Launching a frontal attack on the Bharatiya Janata Party (BJP), Congress president Sonia Gandhi on Saturday described Prime Minister Narendra Modi-led government at the Centre as an empty vessel that makes the loudest noise. "Empty vessels make the most noise, being loud doesn't mean you are speaking the truth," she said while addressing a rally here. Claiming that the Centre was taking credit by renaming the programmes started by the previous UPA regime, Sonia Gandhi said, "The BJP is taking credit by renaming programmes started by us." New Delhi, July 31 : Dismissing former union minister K. Natwar Singh's bombshell about Congress president Sonia Gandhi in his autobiography, former prime minister Dr. Manmohan Singh has categorically stated that no files were sent from the Prime Minister's Office (PMO) to Gandhi's 10 Janpath residence for clearance during his tenure. "No files used to go from PMO to 10 Janpath," Dr. Singh said. Natwar Singh has reportedly given an explosive interview to Headlines Today on his memoirs "One Life Is Not Enough: An Autobiography" in which he details his public life with some focus on Sonia Gandhi. 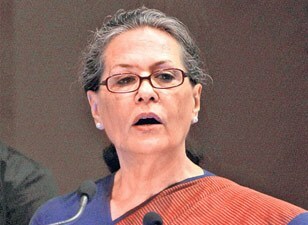 New Delhi: UPA Chairperson Sonia Gandhi has written to Prime Minister Narendra Modi urging him to implement the commitments made by the previous Congress-led government to Seemandhra which include grant of special category status to it and execution of Polavaram multi-purpose irrigation project. She said the Andhra Pradesh Reorganisation Act, 2014, by which Telangana was carved out of Andhra Pradesh, contains various investment and other commitments by the government of India to Seemandhra region. The Congress President promised all cooperation to the Modi government in implementing these commitments. New Delhi, May 24 : Congress president Sonia Gandhi Saturday called for drawing "appropriate lessons from unprecedented setback" to the party in the Lok Sabha election and noted that the party was a formidable group in parliament with its combined strength in the Lok Sabha and the Rajya Sabha. Addressing the first meeting of the Congress Parliamentary Party (CPP) after the general election, Gandhi also disapproved of party leaders venting in public their feelings about the party's loss in the polls. New Delhi, May 19 : Congress chief Sonia Gandhi and her son and party vice president Rahul Gandhi Monday offered to resign for the party's worst performance in a general election, but the Congress Working Committee unanimously rejected it, senior leader Amarinder Singh said. "Sonia Gandhi-ji and Rahul Gandhi offered to resign, but the CWC (Congress Working Committee) rejected it," the former Punjab chief minister told IANS. Party sources said Prime Minister Manmohan Singh also said it was not a solution to the problem. New Delhi, May 16 : Congress president Sonia Gandhi and her son and party vice president Rahul Gandhi Friday took responsibility for the party's worst ever drubbing in the Lok Sabha election. Addressing a brief press conference after it became clear that party would be relegated to a poor 50-odd seats, Sonia Gandhi said: "We with all humility accept the mandate of the people and hope that the new government at the centre will uphold the unity and interests of the country." Patna, May 9 : BJP's prime ministerial candidate Narendra Modi Friday targeted Congress president Sonia Gandhi, saying she is "using words like `oonch-neech' for vote bank politics". "Madam, you are president of the party but using words like oonch-neech (high-low) for vote bank politics. It does not look good," Modi said while addressing an election meeting in Motihari in Bihar. He said the likely defeat of the Congress in the Lok Sabha polls has disturbed and worried Sonia Gandhi. Modi said caste-based politics will not benefit anyone in the country. Kushinagar (Uttar Pradesh), May 8 : Congress president Sonia Gandhi Thursday took on the BJP for failing to contain terrorism when it ruled India for six years under Atal Bihari Vajapyee's leadership. The Congress alone was capable of protecting the country's integrity, Gandhi told an election rally here. "The BJP says we are soft on terror. The truth is the nation was marred by terrorist attacks during their six year rule," she said, referring to the 1998-2004 when a BJP-led coalition governed India. Barnala (Punjab), April 26 : Taking on BJP prime ministerial candidate Narendra Modi over his Gujarat development model, Congress president Sonia Gandhi Saturday said it has brought misery to various sections. "Oh God, save the country from such a model. This is the only thing I can say," Sonia Gandhi said while addressing an election rally in Punjab's Barnala town in favour of Congress candidate Vijay Inder Singla for the Sangrur Lok Sabha seat. Moradabad (Uttar Pradesh), April 14 : Congress chief Sonia Gandhi Monday said the UPA government has done a good job in uplifting the living conditions of the minorities. "We have formulated policies to provide higher education to youth, especially the girls, by giving them scholarships under the Maulana Azad Foundation," she said while addressing an election rally here. "The Congress has always worked for social and economic development of the backward class and will continue to do so," Gandhi said. The Congress has provided free treatment and medicines to the poor, she said. 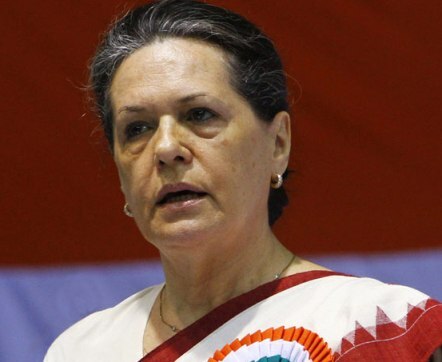 Kolar (Karnataka), April 9 : Cautioning against divisive forces attempting to polarise the country, Congress president Sonia Gandhi Wednesday urged the people to vote for her party in the April 17 Lok Sabha election in the state. "You have a great responsibility in this election to save the nation by voting for the Congress in majority and defeating those forces attempting to divide the country on religious and caste basis," Gandhi said at a public meeting here, about 100 km from Bangalore.